Could Dental Implants Give You Back Your Best Smile? Dental implants are one of the more popular options when it comes to replacing teeth. These devices replace the root of the missing teeth as well as the visible tooth itself. Implants look, feel and function just like real teeth. For this reason, they are quite popular with cosmetic dentists. Are dental implants the only way to improve your smile? While some other alternatives, like dentures and bridges, can be used to replace missing teeth, the key difference is that neither of these alternatives addresses the missing roots. Roots play a very important role in holding the tooth in place and keeping the jawbone tissue stimulated. People who opt to replace missing teeth with dentures or bridges are still susceptible to jawbone tissue loss. If this occurs, the shape of the patient’s face can start to change. With dental implants, patients are free to go about their lives as if they have never lost a tooth. There is no bone tissue loss or rigorous maintenance routine involved. The first thing the dentist will do when a patient is interested in implants is an evaluation. This step determines if the patient has enough healthy jawbone tissue to proceed with the treatment. If the patient lacks adequate amounts of bone tissue, the dentist might recommend bone grafts or alternative tooth replacement options. The dentist will also evaluate the patient's medical history to determine if the person is healthy enough for oral surgery. Once the patient is cleared, the dentist will set a date for the surgical installation of the implant. After injecting an anesthetic, the dentist will cut an incision in the patient's gums to expose the jawbone. A hole is drilled into it, and the implant is placed firmly in the hole. The patient is then given about three to six months for the implant to fuse securely with the surrounding tissue. 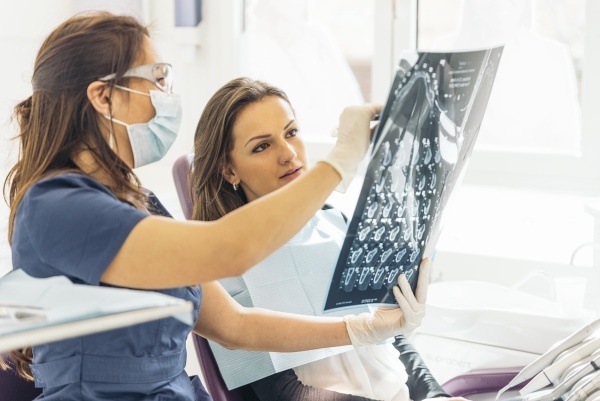 When the implant is firmly held in place by the surrounding bone tissue, the dentist will place a crown on the external-facing end of the implant completing the procedure. There is no need to settle for a gap in your smile. Implants can restore the look and function of a missing tooth, and so can dental prosthetics like dentures and bridges. If you are dealing with a missing tooth or teeth, chat with one of our dentists and explore your options. « How Does IV Conscious Sedation in Dentistry Work?